Weekend Roundup and Some of Kate’s Favorite Fonts! Okay, you guys. I know that it’s a few days before Halloween and that if I were awesome, I would have some magical, ooey-gooey pumpkin concoction for you. It was in the plans. The cards. Actually, it wasn’t pumpkin, it was pears and caramel, but whatever. I was prepared, I was all set to be ahead of schedule in the middle of last week, and then it all kind of hit the fan. So if you’re looking for some Halloween fun, here’s a link to our October section! Can I give you a rundown of my last few days? Not to complain, not to make excuses, not so you’ll pity me, but seriously, so we can all laugh at this together because, really, these are a whole bunch of first-world problems strung together into pure awesomeness. So, as a little bit of background, my husband was out of town for work and we’re remodeling a room in our house. So two stressful things. When my husband made his travel plans, we made arrangements so I would pick him up in Houston, which is 4 1/2 hours away, so we could flagellate ourselves by visiting Ikea on a Saturday. In the course a few days, I brought my hyperactive dog, a kitten that has adopted us, my 8-year-old, my 5-year-old, and my 1-year-old to the vet, which was was pretty much as fun and chaos-free as it sounds. What I thought was going to be a 15-minute errand wound up being a 2-hour errand and included me wandering through a very non-pedestrian-friendly part of my town wearing yoga pants and a yogurt-stained t-shirt, pushing my pajama-clad baby in his stroller while he drew on himself with a pen, praying I wouldn’t see anyone I knew, only to run into a friend from church. I got the most incredible stomachache ever and wound up spending 10 hours in the ER, only to discover it was the perfect storm of womanly problems, a bad stomach bug, and a side effect of an acne medication I’m taking. We ended up going to Houston, anyway, and Baby Will had an epic diaper blowout in the middle of lunch and (of course) I hadn’t brought a change of clothes, so to be super classy, I wrapped him in an Ikea towel that I hadn’t paid for (but I did pay for) and made sure he was still wearing his shoes so no one thought I was a derelict mother. Then on Sunday morning, we deliberately left early only to get caught in both a rainstorm and a major traffic jam, so a 4 1/2 hour drive became an 8 hour drive. We’re gonna talk about fonts instead. Sara and I love fonts in a major way. I love mixing and matching them and discovering new ones. 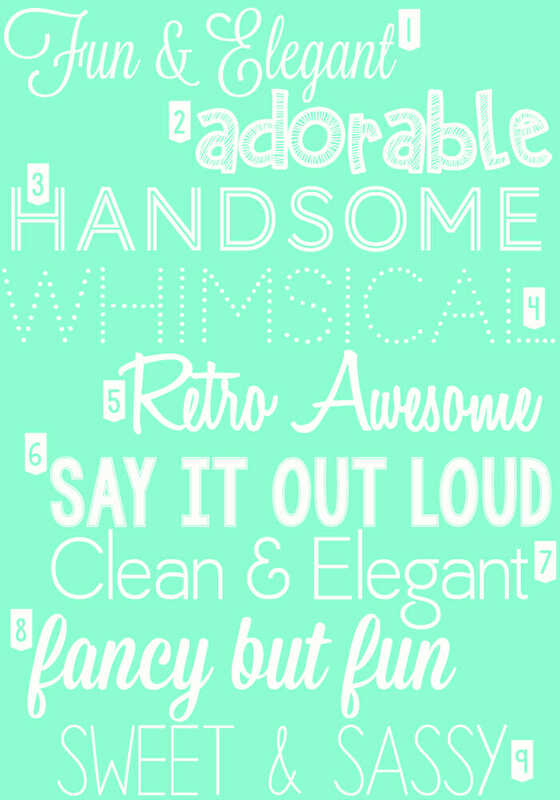 I’m not really artistic or crafty, but fonts are my one major exception–I’m a font nerd. The first thing you need to know when downloading new fonts is where to get them. These are a few of my favorite reputable sites. It’s my general rule that if I have to download a special program or add-on software or ANYTHING other than the font, it’s not worth it–to me, the risk of getting a virus from software like that is too great. Now…to get the fonts onto your computer. This requires 2 (very easy and quick) steps. First, you need to do is click “download” and it will download the font to your computer. Then you’ll need to install it. If you’re using a PC, you can place the fonts directly into the fonts folder (you might have to do a search for it if you can’t find it). In some versions of Windows, you can right click on the font file and it will give you the option to install. If you’re using a Mac, open up the folder that has the file in it and then open the font file (the icon will usually be a sample of the font and will usually end in .ttf or .otf) and then it will give you the option to install. All of this sounds WAY more complicated than it actually is. There’s a lot I could say about fonts–what is a sans font? What’s a serif font? What are wingdings? How do you do cool font effects in Photoshop? That’s pretty much another font in and of itself. So for now, I’m going to share some of my favorite fun fonts–these aren’t really things you’d use for writing a paper or a blog post, but they’re great for word art and quotes and titles and headlines. I literally have hundreds of others that I love, so if you guys like this kind of thing, I’ll do it more often and share the font-y love. Underneath the picture, I’ve included the actual font name and where you can find it. I hope these give you some ideas and that you have a fun and safe Halloween week! Whoa. Talk about hitting the jackpot in the “when it rains, it pours” lottery! So sorry you had to go through so much ick. I say you should just take your Halloween stash and have at it for a good day and a half as therapy, haha! Anywho, I too love a good font! I use DaFont all the time but didn’t know about the others, so thanks tons! Psst: Go for the Reeces! So sorry about your weekend! But THANKS for the font tutorial!!!! I have wanted to learn and felt silly for not even knowing where to begin. So your post is very appreciated! Now off to the store to make sure I have all I need for one of your amazing soups! Even though its warming back up here in Louisiana… We are still making soup! Yes, yes! 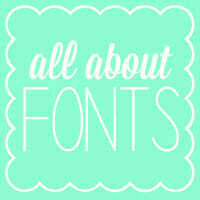 I love finding new fonts! So sorry about your weekend… here’s hoping your Halloween week is fun and filled with delightful, delicious things! You deserve it! Wow! What a horrible day. I remember when I took my then 3 month old to visit my co-workers for the first time. In an adorable little fire truck outfit from Gymboree. On the way he had a huge blowout – we’re talking up the back and in the hair and everything. The carseat was covered as well. And I had also not brought a change of clothes. We had one teeny tiny onesie in 60 degree weather! My goal this week was to read the dummies book on photoshop so I could learn to make my own Subway art and I had asked around with the young as you women that I know and they told me that they didn’t know how! So thanks for the font ideas and motivation to learn to do this. If you did it, yes, I can do it, too. And, I have lots of days that I wish to be young again and have my boys who are probably your age be babies again….but I, too, remember the blowout diaper days! I had to buy a new stroller at the mall on one of them. The old stroller went in the shower when I got home with some of that foamed bathroom cleaner! Oh, you don’t need Photoshop for Dummies to learn how to do subway art! It’s so easy! If you want, just send me an email and I’ll give you a really quick run-down. Or you can read Photoshop for Dummies, you’re not going to hurt my feelings. Laughing so hard about the stroller in the shower! I knew how to download the fonts, just not how to get them to show up in my list of usable fonts. Thanks! I actually flipped to your site just to look at some of your fonts because I decided to start using them on my post pics as well. Incredible timing for me that your new post was about fonts instead of food. Thanks! Ha! Awesome. If there are any that you need the names of, let me know! LOVE the font post! I am so sorry for the series of unfortunate events that led to the font post, but I am addicted to fonts and love to get new ideas. Haha! Loved the stories. One of my favorite things about your blog! One time I was going to Provo from St. George with my 1st baby. I stopped for something and he had a poopy diaper. I can’t remember if it was a blowout, but I went to change him and it was one of the worst diapers ever! Not to give TMI, but it was like little balls of clay that are nearly impossible to get off. So I go to change him and find that I have ONE wipe. One. So there I was running back and forth from the sink to the Koala changing station with wet paper towels trying to avoid a call to DCFS for leaving him unattended! It was awful! I don’t think I got it all off till I arrived at my destination. I love new fonts! Thanks for sharing and hopefully your week goes better than your weekend! Um, your weekend was way worse than mine, haha! I hope your sweet babe is feeling better! HaHaHaHaHa……My son had a diaper blowout too at about 1yr. We were in a friend’s quilt shop, me, hubby and twin 1y olds. Thank GOODNESS no other customers! Baby was standing at my feet while we were talking to friend. Baby looks down, I look down. As I stare in shock my dh looks down. PRICELESS!! It is coming out his COLLAR! Running over his shoes! No one on earth has a diaper bag big enough to handle that sort of mess. 30 min later, 3 people, mop and bucket and roll of paper towel we finally ran home. I NEVER took the babies to that shop again;) We have all been there. An Ikea towel is just fine. You even paid for it! What a great and applicable post for me! No need to ever justify a helpful post, in my opinion. I’ve been looking for a sturdy script font forever. Thank you, thank you! That’s so funny! I live in NorthEast Houston and was gonna go to Ikea but my husband got offered a really good side job… And WOW that was some storm. My six year old woke up crying so I got Netflix going for him them the power went out.. Luckily for only 30 min. I feel as I’ve experienced all those occurrences……just not all in the same day. I don’t know if something changed, but the last 2 site links you list are pointing back to your own site. If you strip out the ourbestbites part, what’s left will get you there. Taking the three kids to the vet (when all they want to do is stand on the big scale to weigh themselves and touch. everything. ), poop diaper with no change of clothes, all the joys of modern motherhood, we share in your frustrations first-world or not 🙂 I love the idea of posting more font ideas! Happy Halloween! Question. I’ve got a mac and I downloaded one of the fonts. Is it possible to use the font in Word? If so… do you know I how I might be able to open it in word? Thanks! BTW… what a rough weekend!! Glad it’s over and done with for you! I have a Mac and the best way to make a font show up in all programs is to install it using the application Font Book. Open the app, and then go to File > Validate File. Find the font you want (probably in your downloads folder). Select the font and wait for it to show up in Font Book. Select the box to the left of the font (if there are multiple styles, you’ll have to select all of them) and then click on on “Install Checked”. Once it finishes installing, you’ll be able to use the font in any application. I’ve been reading your blog for many years and use many of your recipes in the meals I make on a regular basis. I bought your cookbooks and gave them to all my children for Christmas last year. I’m thrilled at how successful you’ve become, and feel like one of your original fans. However, I find it difficult to even find your recipes on the website any more with all the ads. I know it brings in the money for you, but it sure makes your website unpleasant to navigate. Just thought I’d give you some honest feedback from someone who has seen the growth of your popularity. So needed to read this post today! It sounds like an awful experience but thank you for sharing! Um, this post was FANTASTIC!!! I mean, I love your recipes, but this was not only news to me, it was timely–big projects on my to-do list just got amazingly easier!!!! Thank you thank you! love the fonts. Thanks for the safe site recommendations!